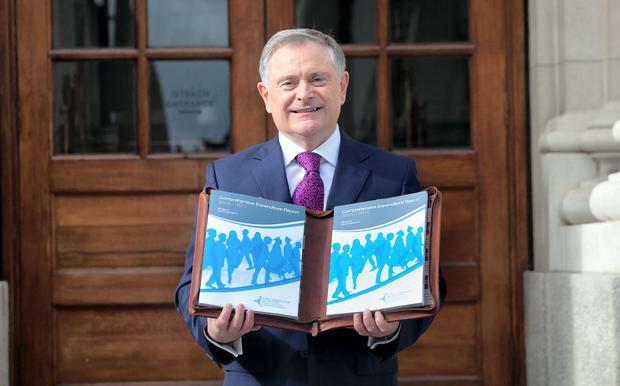 Minister for Public Expenditure Brendan Howlin with the Budget. THE last time the people confronted an Irish government over water charges, the government "bottled it". Facing into an election year, and surrounded by an increasing number of acrimonious court cases involving non-payers and demonstrators, the Fine Gael/Labour/Democratic Left rainbow coalition met at lunchtime on December 19, 1996, and decided to abolish water charges. In fact, they also abolished the residential property tax for good measure. And at a press conference announcing these U-turns, the then Environment Minister, Brendan Howlin, said bin charges would remain - largely because many councils had privatised refuse collections and others would follow suit. Mr Howlin was not the only one associated with that climb-down who is still in Cabinet today. There also in late 1996 were Enda Kenny, Richard Bruton and Michael Noonan, while Joan Burton was a junior minister. All five are again central players in this national drama, which has dominated our politics for all of this past year. On the other side of the divide there is Socialist TD Joe Higgins, who built a political career on the issue. Those who believe paying for water on the basis of use is the only way forward, will hope Messrs Kenny and company have learnt from past follies. They will argue that ultimately somebody always pays for services. If the rainbow had stuck to their guns almost 20 years ago, we might not be having this debate now. And, if the current Government 'bottle it' again, what odds on a re-run of the same old, same old, a few years from now? When you stand back from this current water row and lower the volume, you find there is a depressingly circular and short-term character to the debate on funding basic services. Back in summer of 1977 Jack Lynch's Fianna Fail won a landslide general election by promising to abolish domestic rates among other lavish give-aways funded by massive borrowings. Liam Cosgrave's defeated Fine Gael/Labour coalition were not particularly virtuous on the issue at the time. They were just more sluggish in getting their election gimmicks out there. As the recession bit deep in the early 1980s, central government could not afford the local council grants promised to replace domestic rates revenue. The results were potholes of epic proportions, street furniture in decay, overflowing bins and more pressure on struggling businesses to pay higher commercial rates. So, in 1983, charges were introduced on a discretionary basis for local services, including water, to provide modest local revenue and bridge a widening gap. There were instant charges of "double taxation" against Garret FitzGerald's Fine Gael/Labour coalition. But opposition was slow to build at local level and much of it was Dublin-based, but with strong opposition also in Cork, and especially in Limerick. The court actions for non-payment started, and in 1986 Dublin and Dun Laoghaire authorities temporarily abolished water charges. In 1991, local authorities were on the verge of financial collapse, and an opposition motion urging the abolition of charges and guaranteed council grants was narrowly defeated in the Dail. In 1994 the Federation of Dublin Anti-Water Charges Campaign was set up, following the introduction of water charges of IR£50 to IR£90 per year by the new Dublin county councils - Fingal, South Dublin and Dun Laoghaire/Rathdown. The federation, chaired by Fingal councillor, Joe Higgins, began boycotting water charges and resisting attempts to cut off supplies. By the time abolition came around tensions were evident between the coalition partners, with Labour and Democratic Left decidedly worried by Joe Higgins and his comrades of the left. But as proof of the 'somebody always pays' maxim - the rainbow also seriously hiked stamp duty on property transactions to replace revenues in a foretaste of another disaster to come. Today, the parallels with the recent past speak for themselves, as does the persistence of the political characters on both sides of the argument. But there are four potentially important differences between now and two decades ago. The first is that the troika of EU/ECB/IMF, with whom the Government agreed water charges, is still with us, albeit less prominently. The second is that the Government remains determined to establish the principle of water charges linked, at some level, to water used. The third is that middle Ireland was not in principle opposed to a fair water charge regime to fund investment in a proper system. The fourth is that €180m has so far been spent establishing Irish Water. As the thousands take to the streets this afternoon nationwide, there is still a determination in government to persist with water charges. The strategy is to give additional support to people depending on welfare and tax relief to workers. It is also to get out bills which they hope will appear reasonable and, finally, there is the mammoth task of re-making Irish Water and repairing its image. To conclude our tale, let us also recall that caving in on a big ticket issue is no political guarantee of anything for a beleaguered government. Kenny, Bruton, Howlin, Noonan and Burton will need no reminding that they lost the general election held barely six months after the abolition of water charges. Paul Melia Shane O'Loughlin is a dairy farmer from Aughrim, Co Wicklow. Every day he draws around 10,000 litres of water from a spring on his land, which provides drinking water for his 110-strong herd. Rachel Farrell It's been one week since a hosepipe ban was put in place in the Greater Dublin area and despite fears of the €125 fine for excessive water usage, no fines have been issued to date.